In the end of the third day the teams from Latvia managed to deliver 15 playable games, ranging from board games to cool 3D games that had flying dragons. The event was cool but exhausting. In the end we shipped “Dungeon of Hearts” and had a few hours to take a nap. In “Dungeon of Hearts” you must crawl through procedurally generated dungeons, explore and collect heart gems which can be absorbed or used to make character stronger. We did not implement the continuous dungeon crawling trough levels due to time constraints, but it will be added soon enough. You can check out the prototype here -> http://mightyfingers.com/dungeonOfHearts/ . 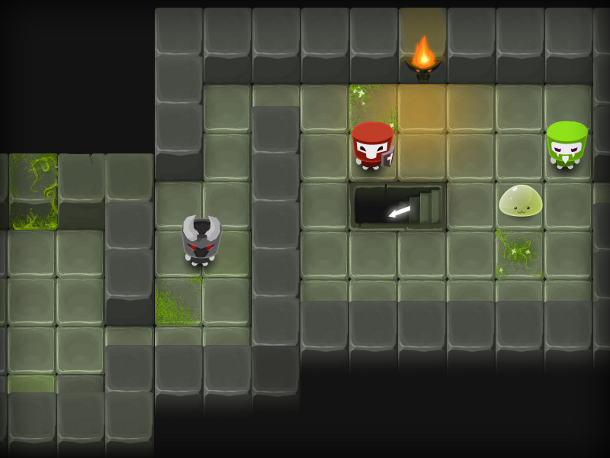 Source is publicly available here -> http://globalgamejam.org/2013/dungeon-hearts . We will continue to work on the game and we are planning to launch playable alfa version soon. In these 48 hours the most time wasting part was the making of GUI. It always takes more time than we expect. CSS rendering bugs and jQuery problems did not help either. We have thought about this for a while and after the public release of our engine we plan to take care of this by making a proper UI editor in Mighty Engine, so you don’t have to waste your time thinking about how to create a good looking and functioning UI . Currently we have field tested the engine with a few games and one of them is currently being played by tens of thousands of users in our local social network, we’ll tell more about this in our next blog post. Currently we are finishing up the documentation and tutorials for the private launch to our subscribers.